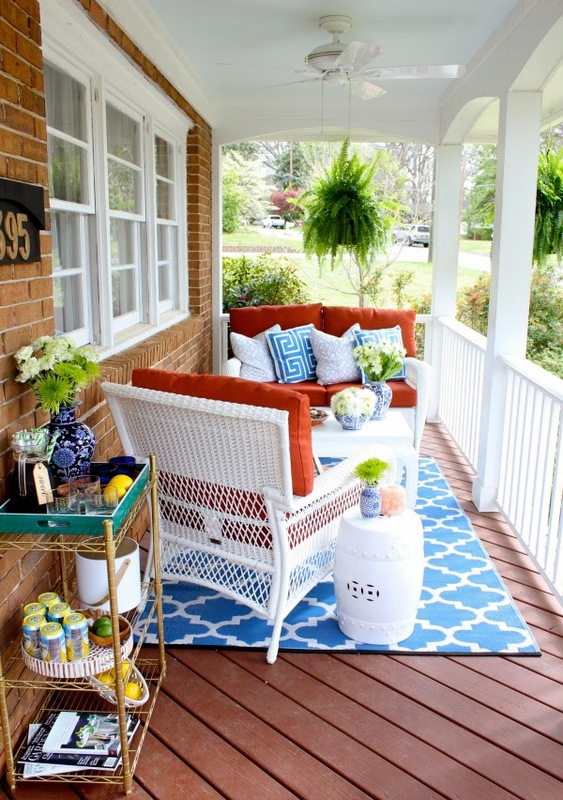 In case you missed it, my front porch made its debut on the Home Depot Apron blog yesterday and to say I was excited and honored is an understatement! Earlier this year I accepted the Home Depot Style Challenge and have been working tirelessly to get my space ready for its closeup. Working with a brand that I love has been so rewarding, especially as the blog approaches it's fourth birthday. Over the years, blogging, in general, has motivated and encouraged me to challenge myself and turn ideas into reality and this project is a perfect example. A big thank you to Home Depot for the opportunity. It really feels like another room has been added to our house! 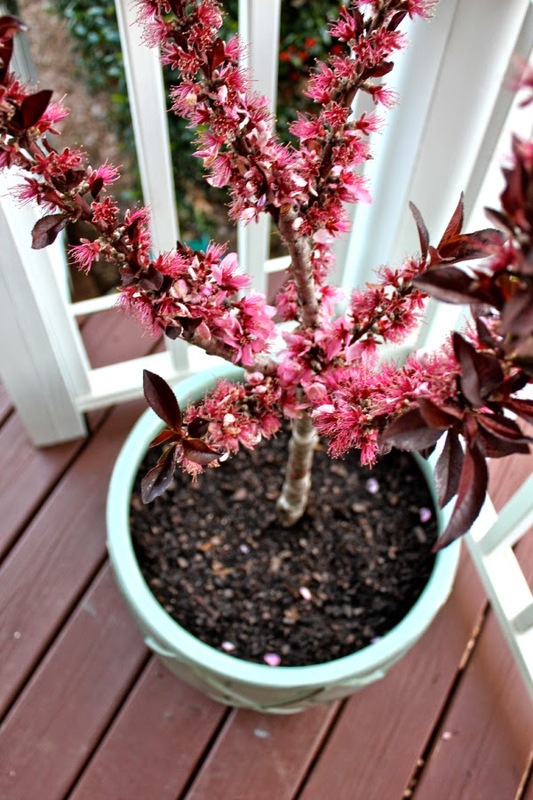 If you haven't had a chance to see the entire style challenge post on Home Depot's website, I encourage you to do that now because there are additional details and pictures of my space as well as other bloggers sharing their patios/porches. I painted the porch ceiling Sparkling Blue by BEHR but I feel I could have gone a shade darker. Even so, I love the end result. Home Depot sent me the Martha Stewart Charlottetown set in white with quarry red cushions. I don't think I could have picked a more perfect set of my porch. It has that charming feminine appearance but the material is very durable! 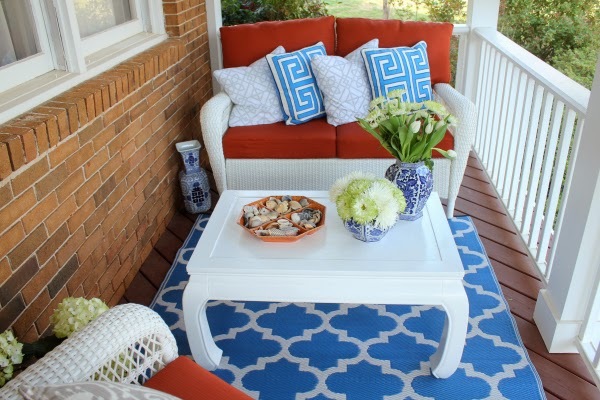 With all the spring pollen here in GA, I've already hosed down the furniture several times which is a major plus for me. 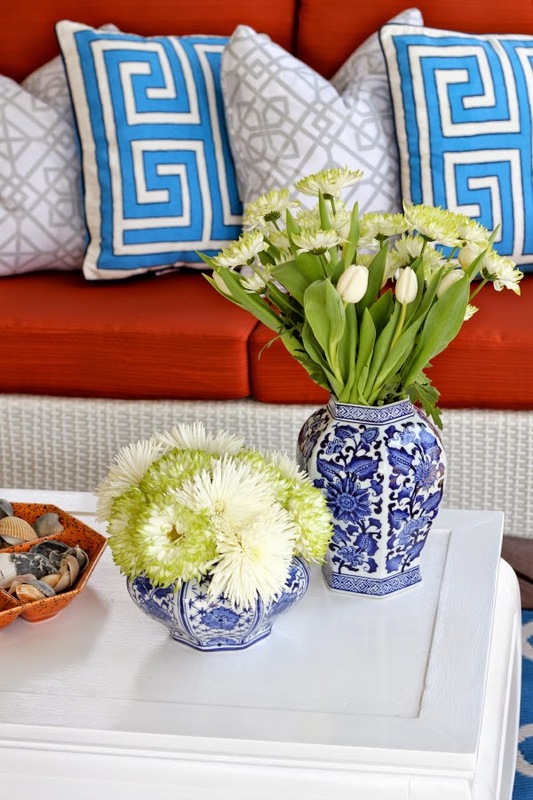 I added blue and white pillows from Jonathan Adler's "Happy Chic" collection which can be found at JCPenny. Love his stuff...it's so bright and vibrant. The grey and white pillows were a random purchase from Homegoods. You'll never believe where I found all the gorgeous blue and white ginger jars....Hobby Lobby. Yes, you heard correctly. The regular prices on these aren't too shabby but I stumbled in one day during a ceramics sale and got them for a steal. You can find these affordable blue and white ginger jars online (here) if you don't live near a storefront. 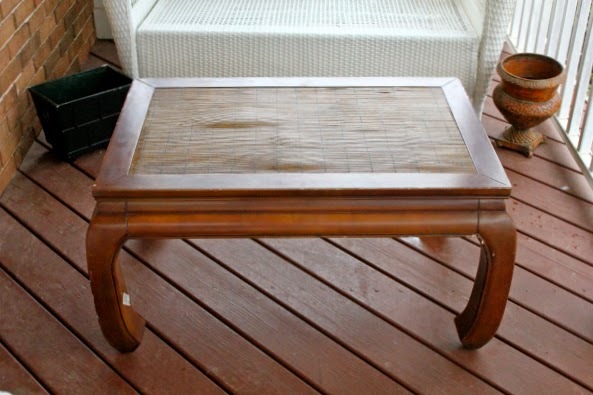 Another great find was this $25 ming style coffee table from the Goodwill. I've always admired these tables so when the Goodwill gods smiled on me that particular day, I picked it up without hesitation. You can see in the before and after photos that the top was a little warped and the table in general was a little rough around the edges. I removed the bamboo top, sanded it, primed it and painted it with two coats of high gloss white paint. I'm still in awe of it's perfect dimensions and classic curves. 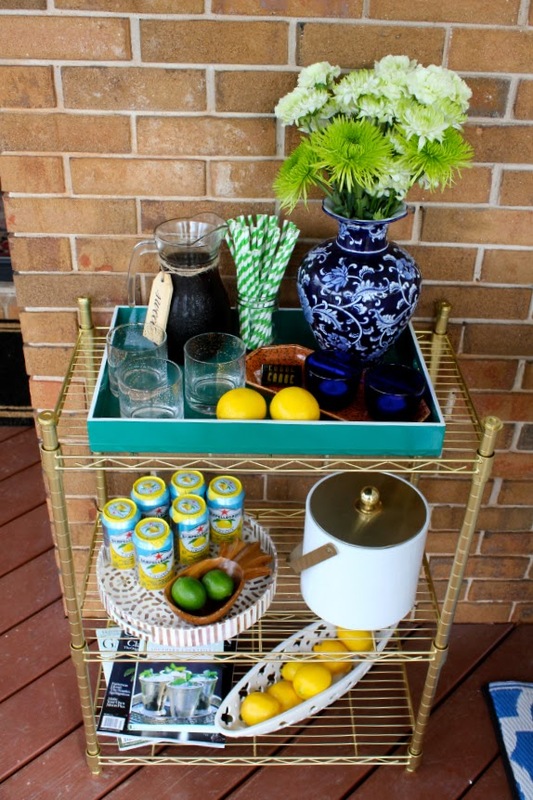 For $20 and the cost of some gold spray paint, I spruced up this wire shelving unit for serving drinks and displaying plants. I found the green lacquer tray and seashell tray at Homegoods. The blue and white vase is from Hobby Lobby and the wooden pineapple and blue glass votives are Goodwill finds too. The ice bucket and orange spotted ceramic tray are part of my vintage Georges Briard collection. 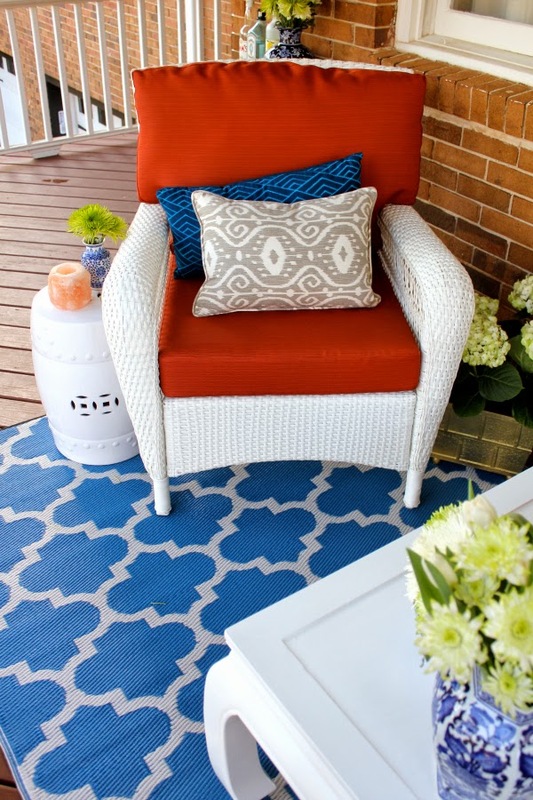 The small white garden stool was purchased at Homegoods for $30. And see that little gold planter holding the hydrangea? That was also a $2 Goodwill find that got a new life thanks to some spray paint. Many people have asked about the rug. 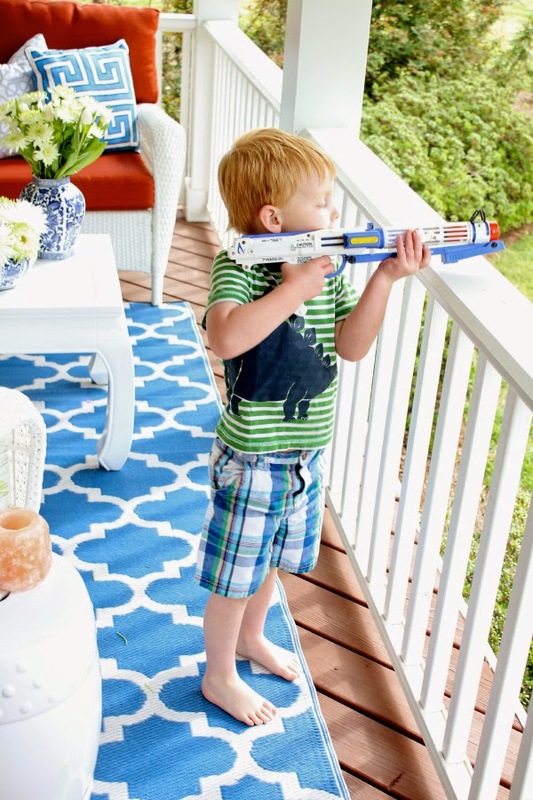 I purchased the 5 x 8 blue and white outdoor rug from Amazon.com for $85 and was over the moon when it arrived. The color was perfect and the material (again) is durable and can be hosed down with water for easy maintenance. It's also super soft for all those little feet that will be running around on it. 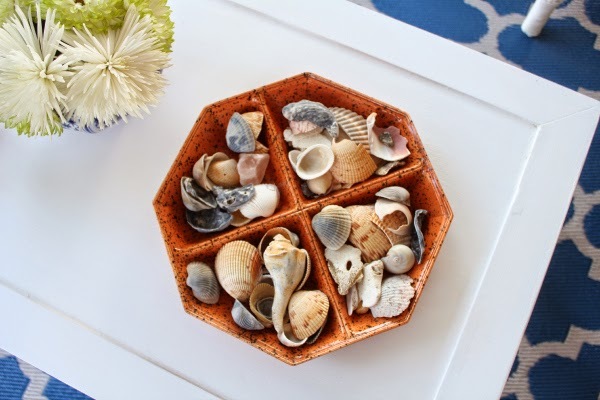 The beaches of Santorini, Greece were my inspiration for the entire space. 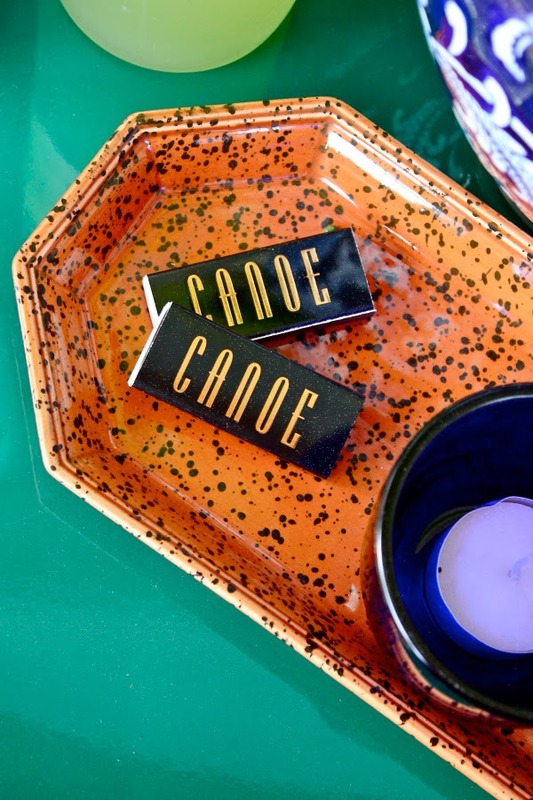 This divided ceramic tray is another vintage Georges Briard piece from my collection. 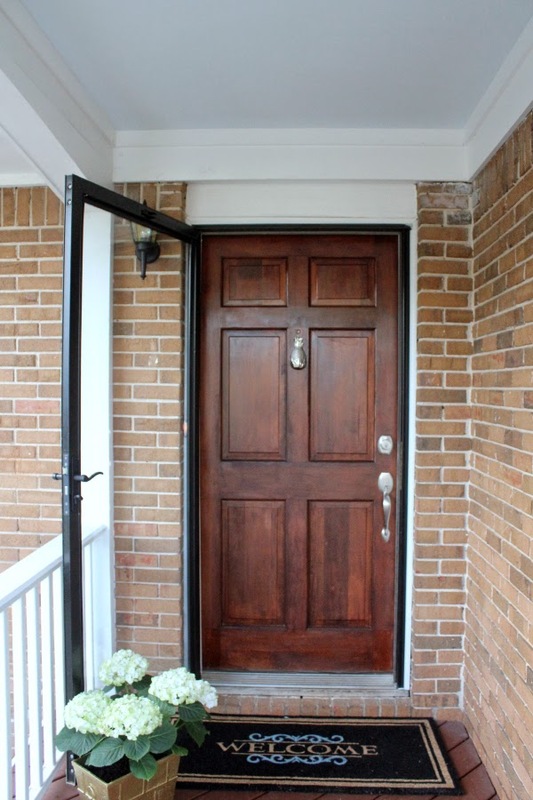 The front entrance also got a makeover with fresh stain, a pineapple door knocker, a new porch light and an over sized doormat. It finally looks ready to welcome visitors! Hope you enjoyed the details and I have GOT to thank my sweet husband for helping get this project done on time. 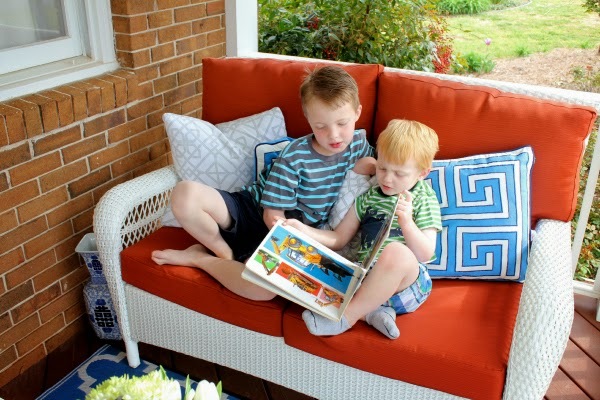 While I was painting and styling and prepping the front porch, he entertained the boys on more than one occasion. I could not have done it without him! *Home Depot provided me with a patio set and gift card to complete the Home Depot Style Challenge. All ideas and opinions are my own. Thanks Home Depot! It looks amazing. A perfect place to relax.